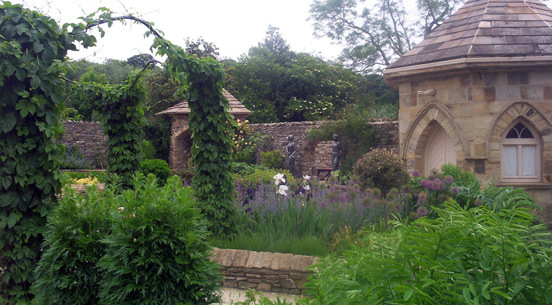 The Herb Garden was part of a field until 2001 when Dennis Fawcett got to work on building a magnificent wall approximately 120 metres long and 2 metres high to form the boundaries of a fascinating herb garden, designed by Tulip Bemrose. 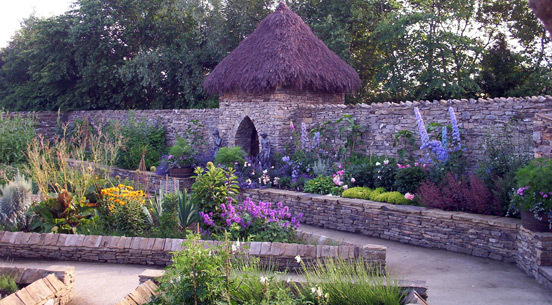 In 2002 a team of builders got to work levelling, draining the ground and installing an automatic irrigation system, then putting into position the 27 individual raised beds with wide paths in-between which are suitable for wheelchairs and the hordes of children. This allows plenty of room for everybody to make a bee line for the attractive potting shed which sells ice cream and teas that can be enjoyed on the adjoining terrace. The first plants were planted in 2003 and have made rapid growth in this sheltered, well drained environment despite being at a height of around 682 feet above sea level, which is not conducive to herbs, most of whose natural habitat are the warm shores of the Mediterranean. 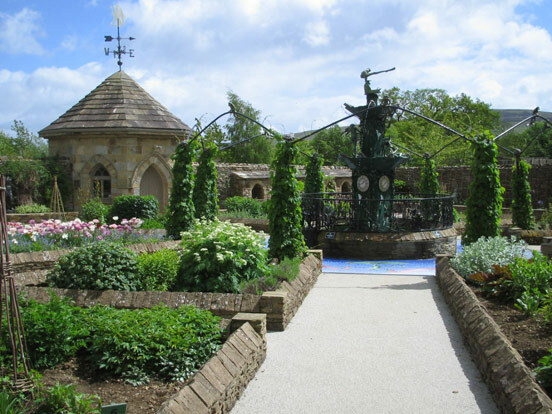 There are over 100 different herbs on display although due to the vagaries of gardening the beds will be constantly altered and updated. The beds have been designed so that they lead to an inner circle of Humulus Lupulus (hops), which festoon 8 pillars and are looped together where the hop flowers hang down in clusters in the autumn. 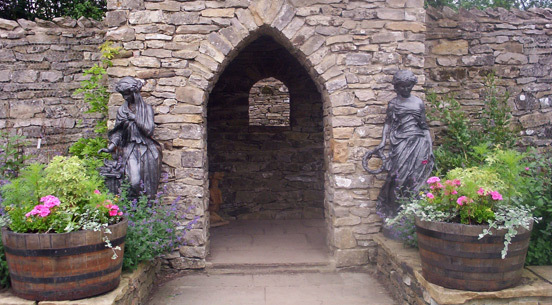 Entry to the Herb garden is via St Cuthbert’s chapel. Pass through the graveyard, go through some doors and you will then find a bewitching garden which is a mass of colour, humming with bees, fluttering with butterflies and with plenty of places to sit and rest without the fear of being drenched! The exit is through the door underneath the heather thatched dovecote. In 2010 the center piece to the herb garden was designed and finished .Be sure to watch the Froggy Fountain closely during the Hour!